Convert PDFs to Numbers, Pages and Keynote formats. 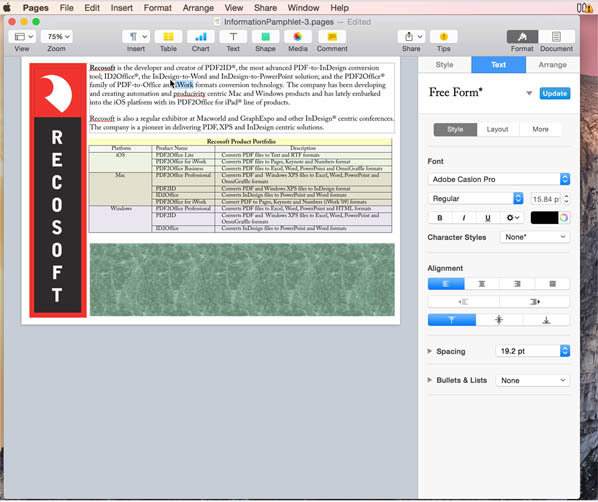 PDF2Office for iWork is the Mac PDF Converter for converting PDFs to editable iWork formats. PDF2Office for iWork converts PDF files to editable Apple Pages, Numbers and Keynote formats. Convert PDF to Pages. Convert PDF to Keynote. Convert PDF to Numbers. 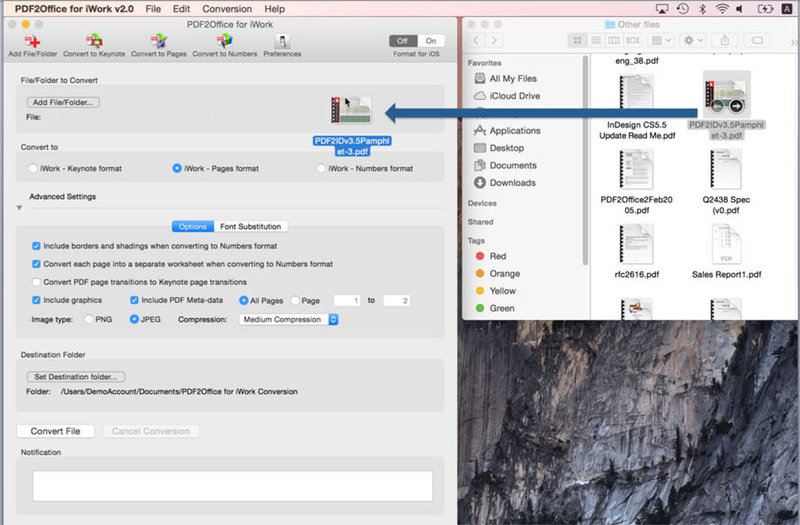 Convert PDF to iWork. View the PDF2Office for iWork coverage at Macworld 2010! Rating: PDF2Office for iWork converts PDF files into editable Pages, Keynote and Numbers files by recreating the layout of the document; forming paragraphs; applying styles; regrouping independent graphic elements; extracting images; creating tables; all automatically without any manual intervention. 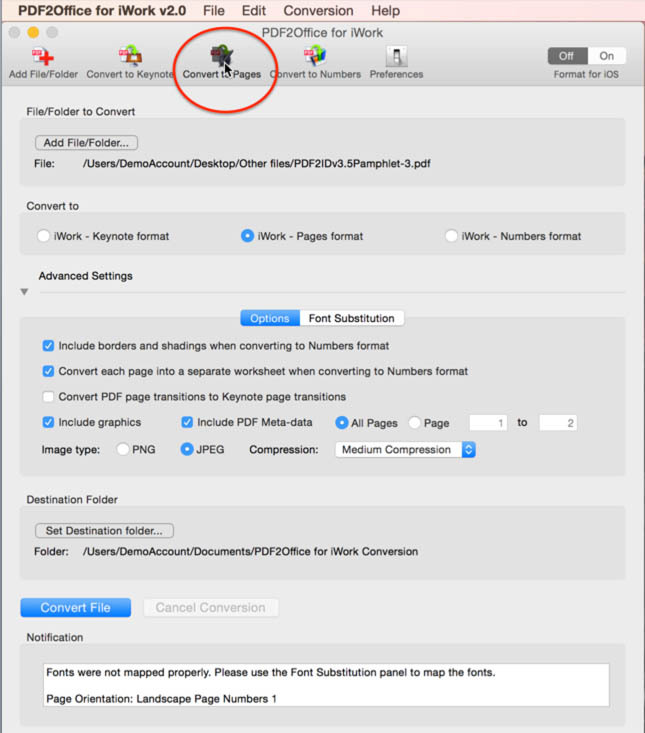 PDF2Office for iWork also provides detailed options for fine-tuning the conversion process. You can specify substitution fonts and also choose to convert the entire PDF file or a range of pages to the Pages, Keynote or Numbers formats. PDF2Office for iWork allows you to recover the contents stored in PDF files making it available for use in iWork. Since PDF2Office for iWork is a standalone tool, it is not necessary to acquire and install additional PDF editing software and tools, resulting in huge cost savings in both time and money. Note: PDF2Office is registered trademark or trademark of Recosoft Corporation in the United States and/or other countries. Apple, Macintosh, Mac, the Mac logo, Numbers, Keynote, Pages, iWork are either trademarks or registered trademarks of Apple, Inc. in the United States and or other countries. All other trademarks are recognized and are the property of their respective owners.